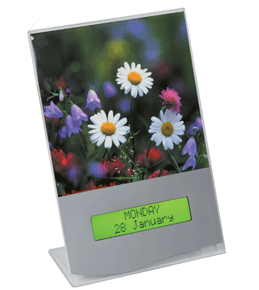 The Forget–me–not Electronic Calendar supports the user in remembering what day it is. The display shows the day of the week and date. The addition of a personal picture makes the calendar a nice piece of home decoration, which catches the eye in a natural way. Without any confusing buttons, the Forget–me–not Electronic Calendar is connected to the power outlet with the provided AC adaptor. In the event of a power cut the display text disappears, but it works normally when the power returns. The Forget–me–not Electronic Calendar is available in several languages. * Special Order: This is not a stock item and is ordered specifically. Unfortunately, no returns, no cancellation, so please call our trained staff with any questions you may have prior to ordering to ensure you make a well informed, educated purchase.